In 1859, Riemann hypothesized that the nontrivial zeros of the Riemann zeta function lie on the vertical line (½ + it) on the complex plane, at which the real part is always ½. Credit: Jan Homann, Wikimedia Commons. 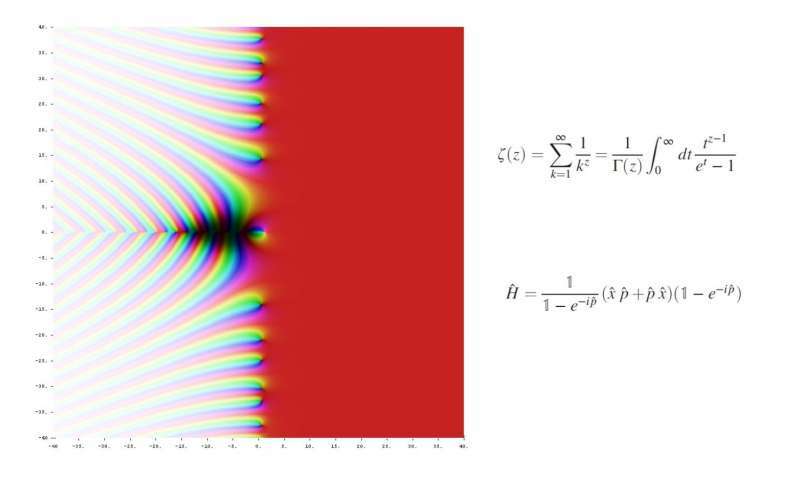 Top: Riemann zeta function. Bottom: The new operator function. (Phys.org)—Researchers have discovered that the solutions to a famous mathematical function called the Riemann zeta function correspond to the solutions of another, different kind of function that may make it easier to solve one of the biggest problems in mathematics: the Riemann hypothesis. If the results can be rigorously verified, then it would finally prove the Riemann hypothesis, which is worth a $1,000,000 Millennium Prize from the Clay Mathematics Institute. While the Riemann hypothesis dates back to 1859, for the past 100 years or so mathematicians have been trying to find an operator function like the one discovered here, as it is considered a key step in the proof. "To our knowledge, this is the first time that an explicit—and perhaps surprisingly relatively simple—operator has been identified whose eigenvalues ['solutions' in matrix terminology] correspond exactly to the nontrivial zeros of the Riemann zeta function," Dorje Brody, a mathematical physicist at Brunel University London and coauthor of the new study, told Phys.org. What still remains to be proven is the second key step: that all of the eigenvalues are real numbers rather than imaginary ones. If future work can prove this, then it would finally prove the Riemann hypothesis. Brody and his coauthors, mathematical physicists Carl Bender of Washington University in St. Louis and Markus Müller of the University of Western Ontario, have published their work in a recent issue of Physical Review Letters. The Riemann hypothesis holds such a strong allure because it is deeply connected to number theory and, in particular, the prime numbers. In his 1859 paper, German mathematician Bernhard Riemann investigated the distribution of the prime numbers—or more precisely, the problem "given an integer N, how many prime numbers are there that are smaller than N?" Riemann's hypothesis was that all of the nontrivial zeros lie along a single vertical line (½ + it) in the complex plane—meaning their real component is always ½, while their imaginary component i varies as you go up and down the line. Over the past 150 years, mathematicians have found literally trillions of nontrivial zeros, and all of them have a real of component of ½, just as Riemann thought. It's widely believed that the Riemann hypothesis is true, and much work has been done based on this assumption. But despite intensive efforts, the Riemann hypothesis—that all of the infinitely many zeros lie on this single line—has not yet been proved. One of the most helpful clues for proving the Riemann hypothesis has come from function theory, which reveals that the values of the imaginary part, t, at which the function vanishes are discrete numbers. This suggests that the nontrivial zeros form a set of real and discrete numbers, which is just like the eigenvalues of another function called a differential operator, which is widely used in physics. In the early 1900s, this similarity led some mathematicians to wonder whether there really exists a differential operator whose eigenvalues correspond exactly to the nontrivial zeros of the Riemann zeta function. Today this idea is called the Hilbert-Pólya conjecture, named after David Hilbert and George Pólya—despite the fact that neither of them published anything about it. "Since there is no publication by Hilbert or Pólya, the exact statement of the Hilbert-Pólya program is subject to some extent to interpretation, but it is probably not unreasonable to say that it consists of two steps: (a) find an operator whose eigenvalues correspond to the nontrivial zeros of the Riemann zeta function; and (b) determine whether the eigenvalues are real," Brody said. "The main focus of our work so far has been on step (a)," he said. "We have identified an operator whose eigenvalues correspond exactly to the nontrivial zeros of the Riemann zeta function. We are only beginning to think about step (b), and indeed how to tackle this challenge. Whether it will be difficult or easy to fill in the missing steps toward step (b), at this point we cannot speculate—further work is needed to get a better feeling as to the scale of difficulty involved." One of the interesting things about the newly discovered operator is that it has close ties with quantum physics. In 1999, when mathematical physicists Michael Berry and Jonathan Keating were investigating the Hilbert-Pólya conjecture, they made another important conjecture. If such an operator exists, they said, then it should correspond to a theoretical quantum system with particular properties. This is now called the Berry-Keating conjecture. But no one has ever found such a system before now, and this is a second important aspect of the new work. "We have identified a quantization condition for the Berry-Keating Hamiltonian, thus essentially verifying the validity of the Berry-Keating conjecture," Brody said. Hamiltonians are often used to describe the energy of physical systems. The new operator, however, doesn't appear to describe any physical system, but is rather a purely mathematical function. "It may be disappointing, but such a Hamiltonian does not seem to represent physical systems in any obvious way; or at least so far we found no indication that our Hamiltonian corresponds to any physical system," Brody said. "But one might then ask 'why publish in PRL?' The answer is because many of the techniques used for some heuristic analysis in our paper that are suggestive are borrowed from techniques of pseudo-Hermitian PT-symmetric quantum theory developed over the past 15 years or so. The conventional understanding of the Hilbert-Pólya conjecture is that the operator (Hamiltonian) should be Hermitian, and one naturally links this to quantum theory whereby Hamiltonians are conventionally demanded to be Hermitian. We are proposing a pseudo-Hermitian form of the Hilbert-Pólya program, which to us seems worthwhile exploring further." Now the biggest challenge that remains is to show that the operator's eigenvalues are real numbers. In general, the researchers are optimistic that the eigenvalues are actually real, and in their paper they present a strong argument for this based on PT symmetry, a concept from quantum physics. Basically, PT symmetry says that you can change the signs of all four components of space-time (three space or "parity" dimensions and one time dimension), and, if the system is PT-symmetric, then the result will look the same as the original. Although nature in general is not PT-symmetric, the operator that the physicists constructed is. But now the researchers want to show that this symmetry gets broken. As they explain in their paper, if it can be shown that the PT symmetry is broken for the imaginary part of the operator, then it would follow that the eigenvalues are all real numbers, which would finally constitute the long-awaited proof of the Riemann hypothesis. It's generally considered that a proof of the Riemann hypothesis will be very useful in computer science, especially cryptography. The researchers also want to determine what their results might actually mean for understanding more fundamental mathematical principles. "What we have explored so far contains little number-theoretic insights; whereas one might expect that, given its importance in number theory, surely any attempt that successfully makes progress on establishing the Riemann hypothesis would offer number-theoretic insights," Brody said. "Of course this need not be the case at all, but nevertheless it would be of interest to explore whether any of the dynamical aspects of the hypothetical system described by our Hamiltonian might be linked to certain number-theoretic results. In this regard, semi-classical analysis on our Hamiltonian would be one of the next objectives." So what is the operator? It's in the picture at the top, below the expression for ζ. A fact which I have not been able to get anyone to listen to is that, apparently, if you graph the function sin(p(i)), where i is an integer and p(i) is the ith prime number, as a scattershot graph, the figure resembles a sequence of overlapping sine waves, with one wave regularly missing. The scattershot graph of sin(i) is nested hexagons, looking rather like chicken wire. There seems a connection between primes and the trigonometric functions, then. In fact, the randomness of differences between prime numbers, p(i+1)-p(i), resembles the sine values. It seems that, for a wide range of sine based functions, each multiplied by i^(1/pi), where pi is the ratio of the circumference of a circle to its diameter, summed from i=1 to i=n, multiplied by ((ln(n)^a)/((n^(1/pi))^b)) is a constant multiple of p(n). Note the comment that the solution to the question of whether the non trivial zeroes of the Riemann zeta function have real part ½ has not yet really been proved. According to Christopher Hitchens "principle", if someone does not provide the proof of a claim to the satisfaction of another individual, then that renders the claim automatically false and the opposite true. By Hitchens' depraved tenet, then, all the non trivial zeroes of the zeta function do not have real part ½ and there is no need to look any further. Every time someone puts the dt at the beginning of the integrand, I die a little inside. More importantly, this is written like a physics paper, and not a math paper, and it's kind of distressing. The basic ideas seem accessible enough to a much wider audience than the paper actually reaches. Hell, even the organization is strange. There isn't even a "Main Theorem." or a "Theorem 1." or something. "Riemann conjectured that the distribution of the prime numbers smaller than N is related to the nontrivial zeros of what's now called the Riemann zeta function, ζ(s)"
I don't get it. It's an operator. What is it operating on? Does there have to be an infinite number of eigenvalues and dimensions? Are those the position and momentum operators in the formula? If the eigenvalues have no imaginary part, does that mean that the space isn't rotated when transformed? Is this eigenvalue not being imaginary connected with parity conjugation? Not a math whiz, so I don't even understand the necessity behind all this. All I have to say is "2/3rds rule", operating complementarily, both backward and forward. The straight line goes between "fractal" levels. As an ex-parte member of the Vulcan High Command (retired to Earth, many Vulcans in Boulder CO), I'll risk censure to say that attempts to prove the RH are essential to your species' development, setting humanity on course towards achieving a stable warp field. We have encountered species that have proven it and others that have falsified it, each defending their claim successfully. Such is our universe, perhaps it is a quantum joke. Over this interstellar wars have been fought. The insight is to be found in the so-called "trivial zeroes" and a special manner of folding them over the "non trivial" zeroes in recursive iteration. The composite is as interesting as the prime, and the progressive product of all primes, and a trivial function applied it, shines a light along your path. According to the article, it's a (linear) operator (whether or not it's bounded, I can't really tell from the article, and that's important too) operating on the Hilbert space L^2(R^+) of square-integrable functions on the positive real line. Oops, on second thought, their operator isn't bounded, because bounded operators have compact spectra, and since the zeroes of ζ are (sort of) its eigenvalues, and since ζ's zeroes are unbounded, then their operator can't be bounded. Could it be that Schroedinger chose i instead of i-squared for the complex function when he devised the wave equation?